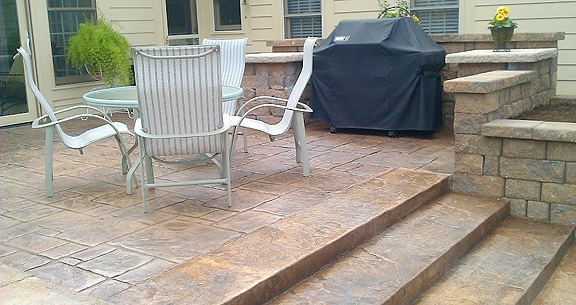 Project obstacles and solutions: The homeowner in this project wanted to revamp an old brick paver patio with a new extended outdoor living space. They had a need for a wheelchair ramp to be constructed as part of the design. Visions in Hardscapes designed a space that not only incorporated stamped colored concrete, but also routed the downspouts under the concrete and through planted areas to irrigate the vegetation before directing the storm water away from the house. The design used 22 yards of imix Spectra colored concrete, utilizing two colors: Yosemite Sand and Canyon Clay. The upper level used a concrete stamp pattern. The continuous steps and lower level was finished with a textured mat. A shake on color hardener and release was used to add a modeled look to the concrete. The wheelchair ramp led into the home's sun room and to an outdoor swing. Visions in Hardscapes created modular concrete retaining walls and planters. They pre-cast custom concrete caps for the grilling and food prep areas. For more information on imix Spectra colored concrete or decorative stamps available from IMI, click here.